I really love the feel of this one. The shorter staple length and fineness of the fiber made it a bit difficult to spin (lots of dropping!) and I seem to tend to spin more thinly when the fiber is fine so this skein looks like it has more yardage than the others, but I still loved the feel of it running through my fingers. 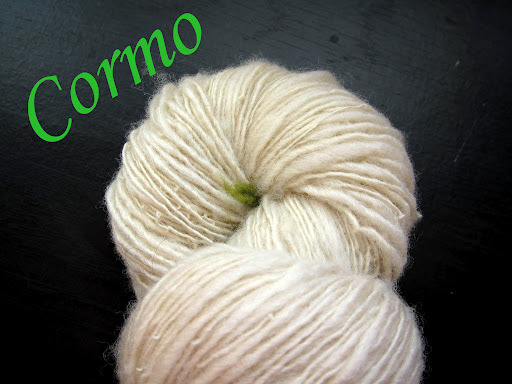 The Cormo breed is top of my list for keeping on the future farm I dream about. I’m about a quarter of the way through, as long as I don’t keep adding breeds. 🙂 I really enjoy this little exercise. On to the next! 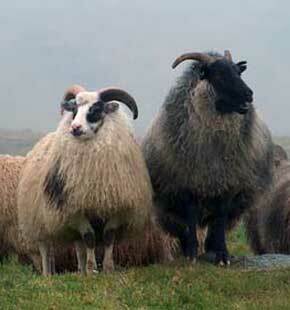 Photo from the Icelandic Sheep Breeders of North America webpage. According to the Fleece and Fiber Sourcebook, the Icelandic breed descended from the sheep the Vikings brought with them when they settled in (you guessed it) Iceland around 900 A.D. The breed has developed in isolation since then because they made it illegal to import more sheep. Thus, that makes the Icelandic breed very genetically “pure” which is especially cool evolutionarily-speaking. The breed is a part of the Northern European Short-Tailed Family, like the Finnish wool I spun up earlier. They are characterized by a naturally short tail, a dual-coated fleece, faces and legs that are free of wool, and apparently very tasty mild-flavored meat. The outercoat consists of long, strong fibers called tog and the undercoat consists of short, soft fibers called thel. 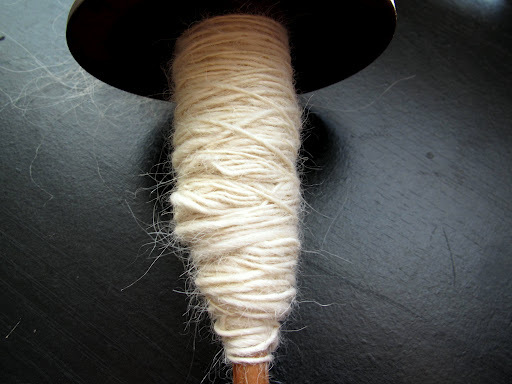 Both types of fiber are used for spinning and they can be prepared to be spun together or separately. The top I have appears to consist entirely of tog, the outer layer. The staple length is long, and can range from 4-18(!) inches. The micron count ranges from 27-31, landing this on the coarser side of the medium range. This is another fiber that feels more hair-like than wool-like, but it is still a true wool (meaning it contains crimp which makes it elastic), not a kemp or guard hair. This fiber drafts extremely easily and in that sense is a pleasure to spin. Despite that, I’m not a huge fan of how it spins up. Too many ends sticking out! Prickly-town, people! Please excuse my messily-wound cop. I had just dropped it and things got all loose and crazy. However, this could be a case where changing my spinning style would result in a more likeable yarn. I tend to grasp a handful of fiber, fluff it up with my fingers, fold it in half, and spin woolen-style “from the fold”. The F&F Sourcebook suggests spinning the tog fibers worsted-style for increased strength and probably to keep those pesky ends more in line. 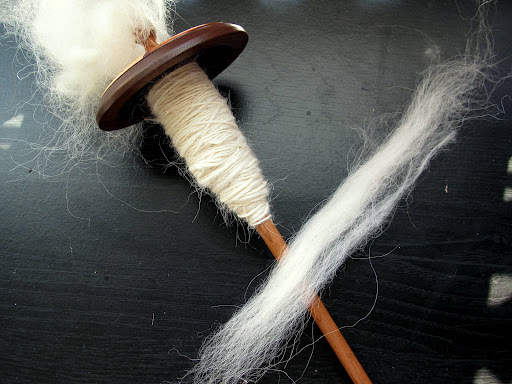 As a quick refresher: woolen spinning means that the fibers are not perfectly aligned, they go in all sorts of directions trapping air between them and resulting in a fluffier yarn. Spinning from the fold creates this misalignment of fibers for me. Worsted spinning means that the fibers are lined up nice and straight before spinning and are spun end-to-end with little overlap, producing a denser and potentially smoother yarn. How do you tend to spin? This entry was posted in sheep, SpinnerStudy by shoelaceswitcher. Bookmark the permalink. Ooh, Icelandic! Such a fun breed to spin. I've spun the tog and thel together, woolen-style, and really liked how the yarn turned out: it was definitely on the sturdy (and scratchy) side, but I think it would be great for a thick outerwear sweater. I love reading about your breed studies! Thank you! 🙂 It was interesting to read about the thel fibers, since the top I had didn't seem to have any I never would've guessed that they had a soft undercoat, too. I completely love when you talk about these. 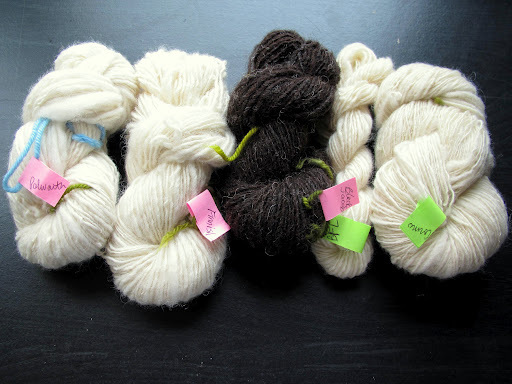 There is so much more to spinning and wool then even I knew! That yarn turned out gorgeous. do you have any idea what you are going to do with these little skeins of yarn? I spin worsted I think! I can't wait to see your next yarn! I also love these kinds of posts, they are so packed with great information! I also really love the idea of a “dream farm”, if you ever get your dream farm I have to come visit and pet your sheep! 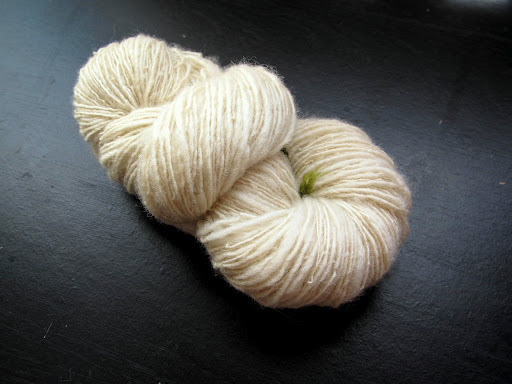 I really like the think and thin look of wool, it is always so pretty!